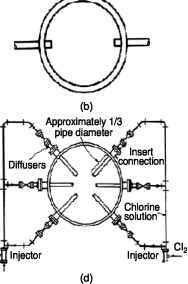 FIGURE 17.7 Schematic of chlorine feeder system using chlorine cylinders. Following the schematic, tonne containers containing liquid chlorine are put on top of a scale in order to measure usage. Through a suitable piping, liquid chlorine under pressure flows into the evaporator. The chlorine is then evaporated into its gaseous state and conveyed into the chlorinator. FIGURE 17.8 Hypochlorinator paced by mainline meter. it, a suction vacuum is created through the piping leading to the chlorinator thereby abstracting the chlorine gas. The chlorinator serves as the metering device. The gas mixes with the water in the injector producing the HOCl chlorine solution. This solution is then conveyed into diffusers at the point of application to the flowing water to be disinfected. Note the chlorine gas detector. The liquid chlorine is under pressure and could break pipe connections, so the location at the container section is appropriate. Also note the expansion tank and the rupture disk. Again, because the liquid chlorine is under a very high pressure, any leakage that may occur in the piping may be stopped by rupturing the disk and allowing the chlorine to expand into the expansion tank. Figure 17.6 shows the chlorine gas system that also uses tonne containers but without the evaporator, while Figure 17.7 shows the system that uses the smaller chlorine cylinders. In these systems, the liquid chlorine is evaporated into gas through the pressure reducing value, instead of evaporators. The operating principle is the same: the gaseous chlorine is abstracted from the chlorinator, which serves as the metering device, through vacuum created by the chlorine injector. The resulting chlorine solution produced at the injector is then conveyed to diffusers at the point of application. Also note the chlorine detector. Liquid chlorine is always under pressure, therefore, chlorine detectors must be provided; however, the system is a little smaller than the one using evaporators, so the rupture disk and the expansion tank are not provided. Hypochlorinators are most suited for smaller installations. For installations serving about ten people, it is possible to use drip-fed hypochlorinators. For up to 100 people, orifice-controlled feeders using a constant head tank mounted overhead and fed by gravity can be used successfully. The most satisfactory means of feeding hypochlorite solutions is through the use of low capacity proportioning pumps. Figure 17.8 shows the hypochlorinator using low capacity proportioning pumps. As indicated in the elevation drawing, hypochlorite solution is sucked from the hypochlorite tank by the proportioning pump. The amount of dosage is proportioned according to the reading of the meter shown in the plan drawing. 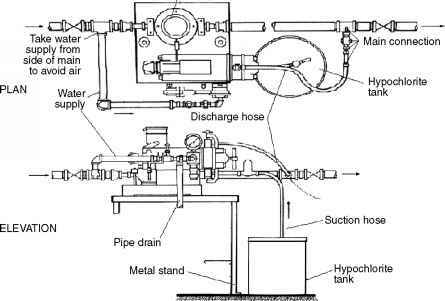 The hypochlorite solution is then injected into the main at the discharge side of the chlorinator through the discharge hose. Example 17.13 Specify the chlorine dosing system to be used for a wastewater treatment plant processing an average of 25,000 m /d of wastewater. The peaking factor is 3.0 and the regulatory agency requires a dosage of 20.0 mg/L. Dosage control. There are five ways of providing dosage control. The first one is manual control. This is the simplest and involves the operator adjusting the flow rate of chlorine to match requirements. 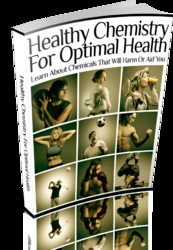 The chlorine residual is checked at intervals of time such as 15 min and dosage adjusted accordingly. The residual desired may be in the vicinity of 0.5 mg/L. This method of control is obviously used in small facilities. The second method is program control. The program control is a selected set pattern of dosage that must have already been determined to effect the desired disinfection. Program control is the cheapest way to attain automatic control. The third method is flow-portioned control. Flow-proportioned control proportions dosage according to the flow rate of the water to be disinfected. This is the case of the hypochlorite dosing system of Figure 17.8. The rate of suction of the solution is proportioned to the reading of the meter. Flow-proportioned control is also called flow-paced control. The fourth method is residual-proportioned control. Residual-proportioned control proportions dosage according to the amount of chlorine residual desired. This system requires an automatic residual chlorine analyzer at the effluent and a signal transmitter. The signal is sent to a controller that then changes valve settings for proper dosage. The fifth and final method is the combination of the flow-proportioned and residual-proportioned control. In this setup, the two signals coming from the flow meter and the residual chlorine analyzer are transmitted to a controller that calculates the resulting valve setting according to these signals' input. 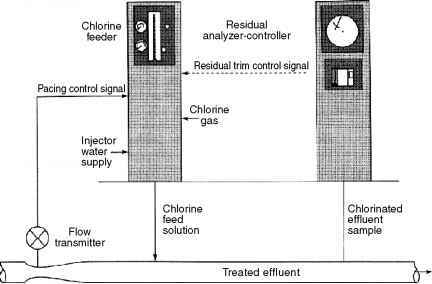 FIGURE 17.9 Automatic residual chlorine control using combined flow-proportioned and residual-proportioned control. feeder would be the controller that combines the two input signals to generate a command to adjust the valves to the correct setting. The correct valve setting then dispenses chlorine solution as shown by the arrow labeled "chlorine feed solution." Example 17.14 The residual chlorine analyzer transmits a signal corresponding to 0.7 mg/L of chlorine and the flow transmitter transmits a signal corresponding to 0.01 m /s. If the desired chlorine residual is 0.5 mg/L, at what rate is the disinfectant dosed into the treated effluent? Chlorine injection and initial mixing. To ensure effective disinfection, chlorine should be completely mixed at the point of application. As learned in the discussion of chlorine chemistry, several intervening substances are present in water and wastewater that exert chlorine demand before the disinfectant can do its job of disinfecting. Thus, a rapid mix should be instituted at the point of application so that the disinfectant can immediately act on the microorganisms rather than wasting time reacting with extraneous intervening substances. The unit operation of mixing has already been discussed under the chapter on mixing and flocculation. Other mixing devices that have not been discussed in that chapter are shown in Figures 17.10 and 17.11. The arrangement in Figure 17.10a is used to inject disinfectant into waters and wastewaters flowing in small pipes. Figure 17.10b is also an arrangement used for small pipes but with dual injection points. As the flow moves downstream, the disinfectant is mixed with the liquid due to turbulence. For injection into larger pipes, the arrangement in Figures 17.10c and 17.10d may be used. In Figure 17.10c, a PVC pipe is perforated along its length. The perforations are for the disinfectant to diffuse through. The process of diffusing through the perforations causes turbulence and mixing. Figure 17.10d shows multiple injection ports converging into a point. The turbulence caused by this arrangement and the turbulence of the flowing water mixes the disinfectant. Figure 17.11a shows a mixing induced by the turbulence produced by a submerged baffle. The arrangement in Figure 17.11b produces turbulence over and under the baffles. The arrangement shown in 17.11c is similar to the one shown in Figure 17.10c, except that in the former, the diffuser is installed in a closed conduit; the latter is in an open channel. The arrangement in Figure 17.11d is also in an open channel and is equipped with a hanging-nozzle type diffuser. Contact time and chlorine dosage. The two most important parameters used in the design of chlorine contact tanks is the contact time and dosage of chlorine. These parameters have already been discussed; the equation is given by the universal law of disinfection, Equation (17.2). 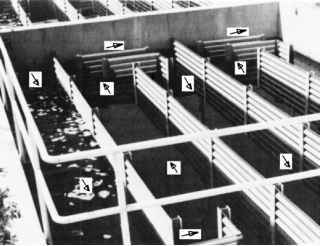 Figure 17.12 shows a contact tank used to disinfect treated sewage. As shown in Figure 17.12, the flow of water is in a serpentine configuration; the direction of the arrows indicates the direction of flow. This configuration allows the satisfaction of the contact time. Since the channel flow cross section is compressed into a smaller cross-section area, this scheme approximates a plug flow. Note that the figure shown is only one of the contact tank compartments in this plant. One of the other compartments is partly shown at the top of the figure. Example 17.15 A chlorine disinfection study was conducted to determine the constants of Equation (17.2). For a log 2 removal efficiency, the value of m is found to be 0.35 and the value of k is found to be 100. Calculate the contact time if the regulatory agency requires a chlorine dose of 20 mg/L. Maintenance of self-cleaning velocity. In the case of sewage treatment plants, some solids would have escaped settling. In the case of water treatment plants, however, the effluent should be very clear with no danger of solids depositing on the chlorine contact tank. As in any design of open channels, the velocity through the cross section should be self-cleaning. We have seen this requirement in design of sewers. The design of chlorine contact tanks is no exception. 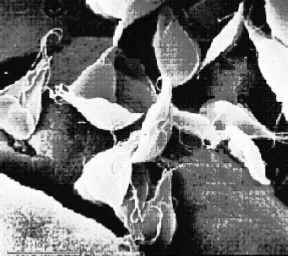 Self-cleaning velocities of 2.0 to 4.5 m/min have been mentioned in the literature. Example 17.16 A total flow of 1000 m /d is to be disinfected. What should be the cross-sectional area of the serpentine channel in order to maintain self-cleaning velocity? What would be the total combined length of the channel if the contact time has been calculated to be 35 min?